Lat: 33.57° N Lon: 86.75° W Elev: 643 ft.
Cloudy. Rain showers likely late in the evening, then chance of rain showers after midnight. Slight chance of rain showers late in the night. Near steady temperature in the lower 60s. Southwest winds 5 to 10 mph shifting to the west after midnight. Chance of rain 70 percent. Partly cloudy in the morning then clearing. Highs in the mid 70s. Northwest winds 10 to 15 mph. Cooler, clear. Lows in the upper 40s. 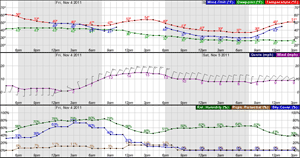 Northwest winds around 5 mph in the evening then becoming light. Mostly sunny. Highs in the upper 70s. Southeast winds around 5 mph shifting to the southwest in the afternoon. Mostly cloudy in the evening then becoming partly cloudy. Lows in the upper 50s. Southwest winds 5 to 10 mph. Partly cloudy with a 20 percent chance of thunderstorms. Highs in the upper 70s. 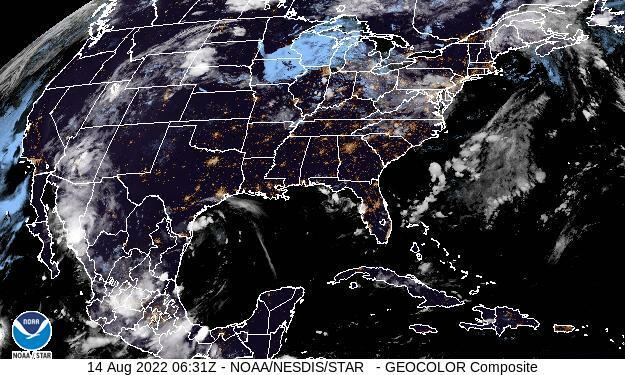 Mostly cloudy with a 30 percent chance of thunderstorms. Highs in the mid 80s.